Fill a tall cocktail glass with small ice cubes. 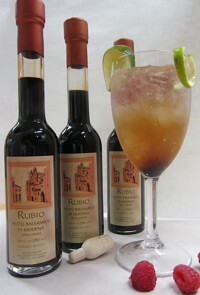 Add vodka, simple syrup, lime juice, and four drops of Rubio (Rubio will sink to bottom). Fill glass with sparkling water or club soda. Taste, and add more lime juice and/or Rubio if desired. Garnish rim with lime peel. In a small saucepan, add sugar to water, bring to a boil, and boil for a few minutes until sugar dissolves.